Pittsburgh Penguins center Sidney Crosby celebrates his first-period goal with center Jake Guentzel and right wing Patric Hornqvist during Game 3 against the Philadelphia Flyers. The three women juggling sandwiches and soft drinks in the Wells Fargo Center main concourse were at the eye of a derisive tornado. The trio, from a place a few hours from Philadelphia that no one's ever heard of, were bold enough to deck themselves out in black and yellow Pittsburgh Penguins gear and bear the brunt of every stare that passed them. And, of course, more than a few Flyers fans had something to say to them. Their reaction was always the same: We’ll see who’s laughing later. By the end of the day, the final laugh belonged to their beloved Penguins, who scored more goals in five seconds of Sunday’s playoff game than the Flyers did the entire 60 minutes. By the 15-minute mark of the second period, a once-raucous Wells Fargo Center had transformed into an arid, barren Death Valley — besides, of course, the three female Penguin fans. A few lathered-up Flyers’ fans could still be heard here and there. Otherwise, the two-time defending Stanley Cup champion Penguins did their job, stealing back the momentum from the Flyers and zapping any of the remaining life force from their fans. With the 5-1 victory on Sunday, Pittsburgh took a 2-1 lead over the Flyers in their best-of-seven Eastern Conference opening-round series. Game 4 returns South Philly on Wednesday, where the Flyers will need to win to prevent going back to Pittsburgh down 3-1 and facing elimination. Fueled by a throaty home crowd, the Flyers had the Penguins on their heels during the first half of the first period. Nolan Patrick had a great scoring chance but was stymied by Penguins’ goalie Matt Murray with a great glove save with 18:46 left in the opening stanza, creating an early theme. But after the first 10 minutes gave the perception this could finally be the first close game of the series, the Penguins, well, they became "the Penguins." The second period opened up what had been a close game as Pittsburgh erupted for three goals in 4:05, the last two coming just five seconds apart. Evgeni Malkin scored on a power play with 13:12 left in the period, then right off the ensuing faceoff, Brian Dumoulin beat Brian Elliott to give the Penguins a 4-0 lead and all but seal the victory. “I should have taken a timeout after the third [goal in the second],” Flyers’ coach Dave Hakstol said. “We had a good first period, but we didn’t duplicate it to start the second period. Hindsight is 20-20, you don’t get it back. You always want to save that timeout because we were playing well. “We had a bad stretch, we dug a little bit of a hole, but I had no doubt we could come back and dig our way out of that hole. You want to save that timeout for a critical time at the end of the game. Now going over and putting it in your back pocket, what good does it do? “That would have been one thing to stop that momentum. Because that fourth goal, now you’re in a real deep hole. That’s tough to come back from. We’re not looking to take solace in anything. We had a good start tonight. If you really want to get to the heart of one issue, we took six minor penalties in about 30-minute span in the middle of this hockey game. Sidney Crosby had the assists on two of the three second-period goals and finished with a goal and three assists. “They came hard and we expected that,” Crosby said. “And [Murray] had to make some big saves, especially with the breakaway early. That helped set the tone for us. I’ve always said before [Philadelphia] is a tough environment to come into, and we all prepare knowing that. Crosby was also told that Flyers’ fans had apparently taken a photo of him and placed it at the bottom of each of the main concourse urinals. When asked about it, a grin slid across the face of the Penguins captain, who criticized its lack of originality. Nor was it the first time Crosby has lit up the Flyers. With 6:18 left in the second, the Flyers did manage to scrounge up some momentum, when Travis Sanheim scored on an assist by Nolan Patrick and Jakub Voracek. It was a cosmetic piece to what was a steamroller job by the Penguins. The Flyers compounded their poor play with some silly mistakes of their own, like when they were called for having too many players on the ice with 9:25 left. While the Flyers escaped that snafu, though it was the type of glaring mistake that can’t be made against a team like Pittsburgh — especially in the playoffs. 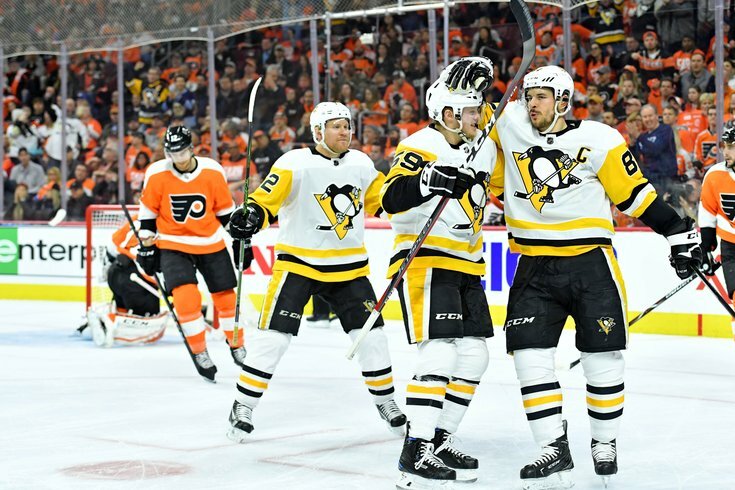 Even Pittsburgh’s first goal, which came on a quirky play, didn’t come from anything the Penguins did, but rather what the Flyers didn’t do – and that was clear the puck. Michael Raffl looked up ice and when his clearing pass hit Sean Couturier on the back of his skate, it bounced to, of all players, Crosby, who whirled around the back of the net and beat Elliott on a wrap-around goal. Prior to that Crosby goal, the Flyers had dominated the flow of play. They pressured the Penguins, who didn’t get their first shot off until there was 10:32 left in the first period, when Elliott stoned Tom Kuhnhackl. The Flyers outshot Pittsburgh, 11-4, in the opening stanza and came away with nothing. The Penguins outshot the Flyers 22-16 the rest of the way. The Flyers were 0-for-6 on the power play and Murray made 26 saves. And during the final minute of play, it wasn't the laughter of those three ladies from the concourse, but rather a chant of “Let’s go Pens, let’s go Pens” that could be heard, amid a chorus of boos, from the sparse crowd remaining.